One of the ways we’re engaging in this important work is by supporting Generation Squeeze, and you can support them too. Generation Squeeze (GenSqueeze) is an advocacy group that amplifies the voice of younger Canadians in politics and the market, backed by cutting-edge research from UBC’s School of Public Health. Recent research shows that climate change is the number one public health threat in the 21st century, and that putting a price on greenhouse gas (GHG) emissions is an essential part of a successful strategy to fight climate change. So when the federal carbon pricing regime came under legal attack, GenSqueeze stepped up to help defend it. You have probably heard that the governments of Saskatchewan and Ontario launched reference cases to ask their courts of appeal whether the federal Greenhouse Gas Pollution Pricing Act is constitutional. Saskatchewan, Ontario, and their supporters are arguing that it is not constitutional because it doesn’t respect the division of powers between the federal and provincial governments. On the other side, the federal government, BC, and other supporters of carbon pricing argue that the Act is constitutional because climate change is a national concern that transcends the ability of any single province to address, and because the federal government has the power to regulate pollution under the “peace, order and good government” provision of the Constitution. GenSqueeze is taking an intergenerational equity lens to the argument. While it agrees with the federal and BC governments that the Greenhouse Gas Pollution Pricing Act is consistent with the constitutional division of powers, GenSqueeze also argues that the Act is consistent with the protection of minority populations, which is a fundamental principle underpinning Canada’s Constitution. In this case, GenSqueeze argues, children and future generations should be considered minorities in need of protection. Think about it – children bear many of the hallmarks of other minorities: they are outnumbered in Canadian society, and they are politically disenfranchised. Minors, including children, are not allowed to vote for their preferred representatives or climate policies, yet children and future generations will be the most affected by the policy choices made by politicians today. They will suffer the worst consequences of climate change while having contributed very little to the overall GHG burden that they will inherit. GenSqueeze and their lawyers are doing an incredible job of advancing these arguments to defend the federal carbon tax and protect children and future generations. They appeared in the Saskatchewan Court of Appeal in February and are preparing to appear in the Ontario Court of Appeal in April. We anticipate that no matter what happens, this case will end up before the Supreme Court of Canada. GenSqueeze is an inspiring organization fighting for everyone’s children and grandchildren. The EDRF is proud to support GenSqueeze, but as a small legal aid fund, supporting the full costs of the litigation is beyond our resources. I invite you to join us in showing support for the incredible work GenSqueeze is doing, by offering a gift through their easy-to-use donation website. Click here to support GenSqueeze today! Donations are eligible for a tax receipt, and near the bottom of the page, you can add a note requesting that the donation be used to support GenSqueeze’s work in the Ontario Court of Appeal and Saskatchewan Court of Appeal. 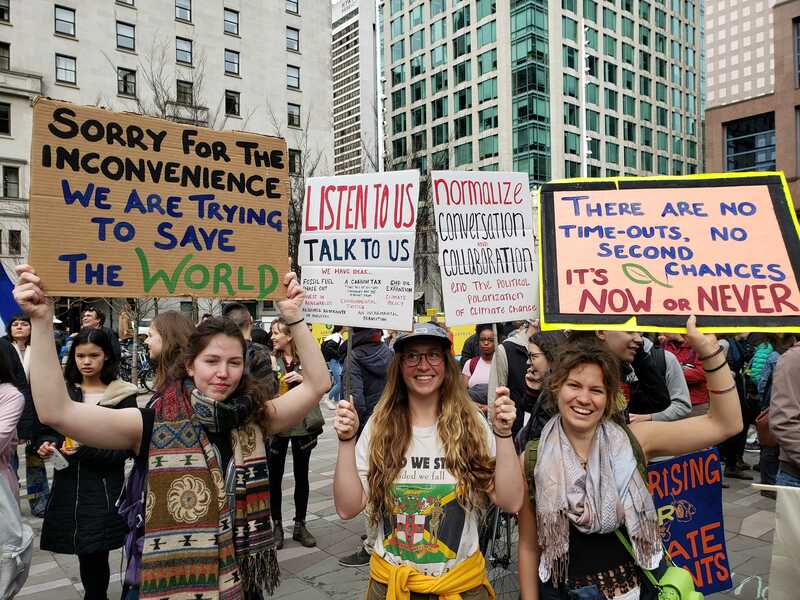 Young people across Canada and the world are stepping up to demand bold action on climate change. Supporting GenSqueeze in this legal action is a great way to help them out.